On June 5, 2018, California voters will have a chance to consider a $4.1 billion parks and water bond, the first parks and water bond to appear on a state ballot in 12 years. San Mateo County Parks Foundation endorses Proposition 68 and urges your support of it too. With this parks and water bond, voters are also being asked to invest in a wide range of projects across urban, suburban and rural California. Together, these investments aim to provide clean drinking water, flood and drought protection, climate resilience, and park access for all. This bond directs funding to protect our ocean, coastal and bay resources, and our rivers, creeks and streams. This is our green infrastructure, the backbone of healthy communities and a healthy economy. We must continue to do what Californians have done since the first parks bond was approved by voters in 1928, preserving areas like Mount Diablo and Mount Tamalpais. This is an opportunity to ensure the investments that have been made in our world-class parks over the last 100 years are not lost, but enhanced. We can safeguard our children’s future by stewarding the natural environment today. All park advocates must stand together in favor of better outdoor access and clean water for all. 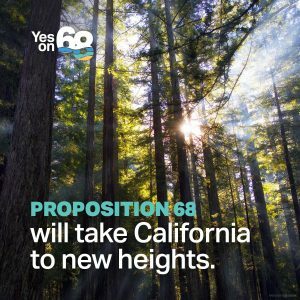 Learn more about Prop 68 here. Coyote Nights is back for Summer 2018!